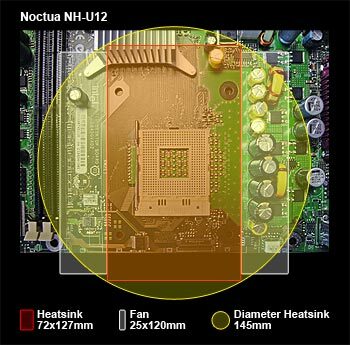 Thanks to the 4 Dual-Heat-Pipes, 37 aluminium cooling fins with a total surface area of more than 3800cm² and soldered joints for optimal heat-transfer, the Noctua NH-U9 achieves superior cooling results that barely fall behind those of its big brother, the NH-U12. 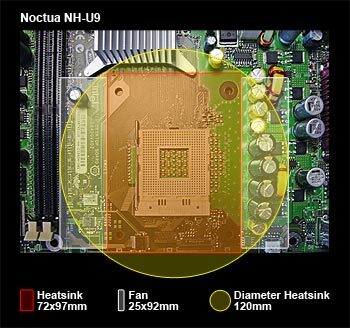 Its compact measurements and the utilisation of 92mm fans make the NH-U9 the first choice when mainboard and case compatibility is essential - no matter whether you use it for super-silent or ultra-high-performance cooling! 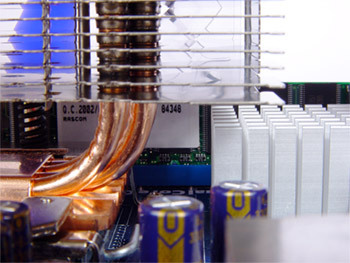 The 4 u-shaped Dual-Heat-Pipes have a huge contact area with the copper base to efficiently absorb the CPU's heat. They form a total of 8 risers to spread the heat throughout the fins. 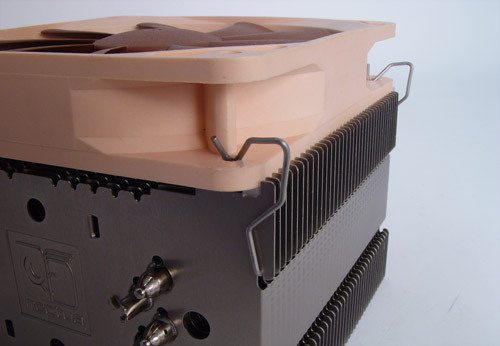 Thanks to a surface area of more than 3800cm², the cooling fins dissipate the heat extremely fast. 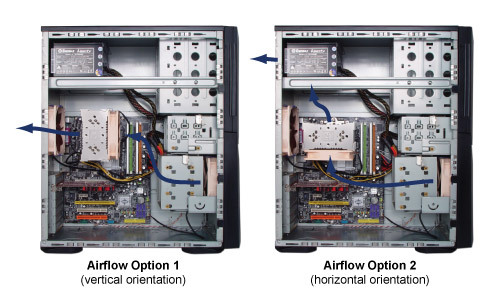 Both the choice of aluminium and the fins' shape and spacing allow for outstanding cooling performance even with silent fans. 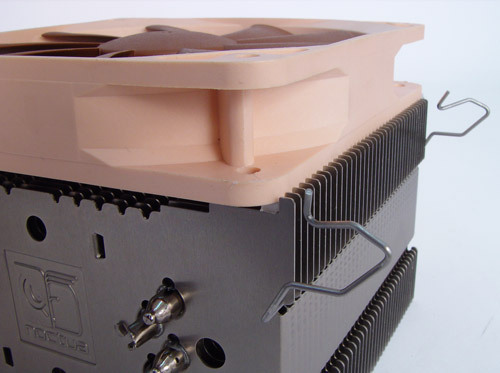 Unlike many other coolers, whose heat-pipes are stuck to the base and the fins, the Noctua NH-U9 possesses high-grade soldered joints to ensure optimal heat transfer. The choice of fan is all yours: Both 80 and 92mm fans can be used on the NH-U9 and provide excellent results regardless of whether silence or performance is your primary concern. Attaching the fan with the steel clips is a child's play and doesn't even require a screwdriver. The supplied anti-vibration strips minimize vibrations transmitted to the cooler and hence allows for extra quietness. 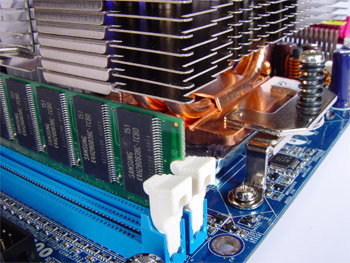 The NH-U12 fits Intel socket 478 and LGA 775 as well as AMD K8. 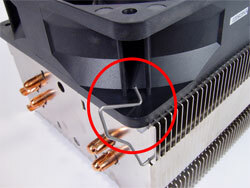 The mounting mechanism using a backplate and spring-loaded screws is as easy as it is secure thanks to the detailed step-by-step installation guide. In addition to the mounting hardware, the package contains a syringe of high-grade thermal paste. Nous voici à 2.8ghz pour 1.45v de vcore toujours, le premier est encore le NH-U9 + Swif-922 pour 36° décidément ce ventirad est vraiment à la hauteur, suivit de peu par le poid lourd des ventirad cuivre, le Zalman 9500led qui lui est à un très respectable 37°, le deuxième Noctua est troisième comme toujours à 38°, tout ce joue dans un mouchoir de poche, leur différence de un ou deux degrés les positionnent dans le top des ventirad heatpipes. Als eerste valt ons op dat de Noctua zijn hoofd enorm koel houdt voor een passieve CPU koeler met temperaturen van 28 graden Celcius idle en 32 onder load. De NH-U9 levert zelfs betere temperaturen dan onze stock koeler die de processor terugbrengt naar 35 graden onder idle load en 42 graden onder load. The Noctua NH-U9 performed well under pressure, posting a two degree difference in idle temps and a fantastic five degree difference in load temps over its stock configuration. Not only that, but we also managed to gain another 22 MHz (2 MHz HTT) on our overclock. Despite the difference between the NH-U9 and its big brother, the NH-U9 is still a top performer according to our tests. Le NH-U9 permet de refroidir un pentium D 930 au TDP de 130 Watts sans difficulté. El Noctua NH-U9 es un excelente disipador que, incluso con el ventilador menos potente, mejora en 1ºC la temperatura del Thermalright XP-120 equipado con el muy potente Silverstone FM-121. Equipado con un ventilador más potente, la diferencia se agranda, llegando a ser de 5ºC en la prueba de overclock extremo (1,65V en el núcleo es el voltaje a partir del cual ya te empiezas a plantear poner una refrigeración líquida). Lo que no cuentan las cifras es lo increiblemente silencioso que es este disipador incluso equipado con el ventilador SwiF-922 que es más potente que el SwiF-921. Es tan silencioso que la primera vez que lo conecté pensé que no se había encendido el ventilador porque, simplemente, no lo oía. Por tanto, altamente recomendado, incluso para overclocks moderados. Test verdict: En resumen: Estos disipadores me han dejado completamente anonadados con sus resultados. Silencio y prestaciones, todo en un mísmo paquete... Y parecía imposible! onsidering the results from the NH-U12, we were expecting great things from the smaller NH-U9. We weren?t disappointed. 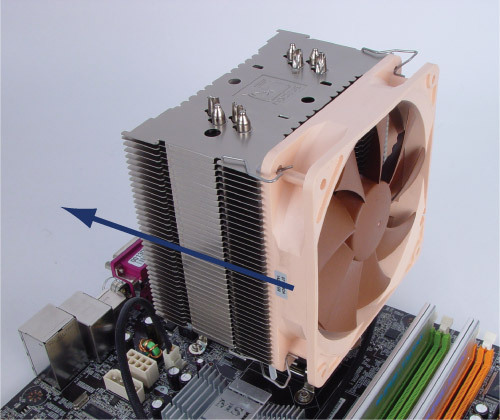 Equipped with one 90mm fan the NH-U9 kept our Opteron system at 49C, 9C cooler than the stock AMD heatsink. I give the Noctua NH-U9 high marks for things such as construction, ease of installation and of course performance. Dobre performanse, univerzalnost, odlična izrada, dobar priručnik za uporabu. Les résultats obtenus en passif sont tout simplement bluffant! En particulier pour le NH-U12 qui dépasse à peine 42°C en burn, mais le U9 obtiens quand même un delta de seulement 11°C ce qui nous donne en burn une température de 47° ce qui est tout à fait acceptable. Le NH-U12 révèle tout son potentiel quand il est couplé avec deux ventilateurs Coolink et le tout dans un silence plus qu?appréciable. Der NH-U9 und sein großer Bruder, der NH-U12, spielen in Sachen Verarbeitung und Vielseitigkeit ganz klar in der Oberklasse mit. Das durchdachte Befestigungssystem ermöglich in Verbingung mit der ausführlichen Montageanleitung eine sichere und einfache Montage und man kann den PC sogar mit montiertem Kühler transportieren, was bei derartig kollosalen Kühlern früher nicht in Frage kam. Auch die Verarbeitung beider Kühler ist makellos. Die Kühlleistung von NH-U9 und NH-U12 ist bei Lüftern mit hohen Fördermengen sehr zufriendenstellend, aber sie zeigen erst bei wenig Luftstrom was wirklich in ihnen steckt.